Maltodextrin, Citric Acid, Malic Acid, Natural And Artificial Flavors, Acesulfame-Potassium, Calcium Silicate, Silicon Dioxide, Sucralose, FD&C Blue No. 1. Mix 2 servings (2 scoops) with 6 to 12 oz. of water and consume 30 to 45 minutes before your workout. Stimulant sensitive individuals should assess their tolerance before using. Do not exceed 2 scoops within a 24-hour period. ARNING: Not intended for use by persons under 18. Do not use if pregnant or nursing. Consult a medical doctor if you have a medical condition or before starting any diet or exercise program. One serving of this product contains up to as much caffeine as 2 cups of coffee. Caffeine-sensitive individuals may experience the following symptoms including (but not limited to) restlessness, nervousness, tremors, headache, anxiety, palpitations, increased heart rate, or difficulty sleeping. Do not combine with other sources of caffeine or stimulants. Some individuals may experience a harmless tingling sensation from the concentrated performance dose of beta-alanine. KEEP OUT OF REACH OF CHILDREN. Maltodextrin, Citric Acid, Malic Acid, Natural And Artificial Flavors, Cluster Dextrin, Acesulfame-Potassium, Sucralose, Silicon Dioxide, Calcium Silicate, FD&C Red No. 40. Maltodextrin, Citric Acid, Natural And Artificial Flavor, Malic Acid, Acesulfame-Potassium, Calcium Silicate, Silicon Dioxide, Sucralose, FD&C Red No. 40. Maltodextrin, Citric Acid, Malic Acid, Natural And Artificial Flavor, Acesulfame-Potassium, Calcium Silicate, Silicon Dioxide, Sucralose, FD&C Blue No. 1. 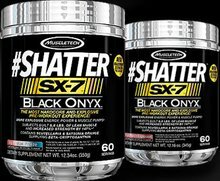 The MuscleTech Research Team challenged their ingenuity to the fullest when creating this new formula, going to through numerous formulas and real-life tests with hard-training athletes before finally arriving at the final, finished formula that is available today. The result is a pre-workout that holds nothing back! To put the finishing touches on this powerful combination of energy and sensory ingredients, each full serving of #Shatter SX-7 features a full researched dose of Beta Alanine as well as a potent yohimbe bark extract supplying yohimbe and rauwolscine. 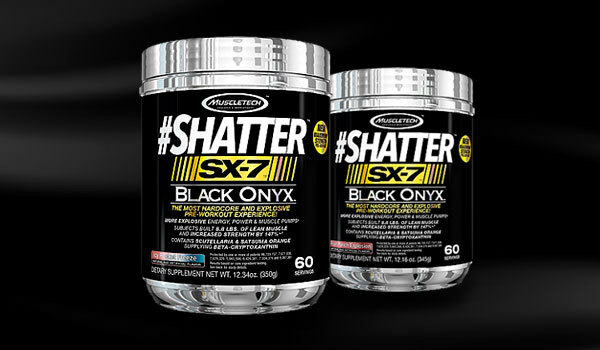 To ensure a high standard of quality, each batch of VitaMax Sport SX-7 Black Onyx also undergoes strict quality control and is third-party tested and verified to ensure that each bottle meets the highest standards of purity, quality and consistency. Blue Raspberry Blast This is a Buy 1 Get 1 FREE offer!